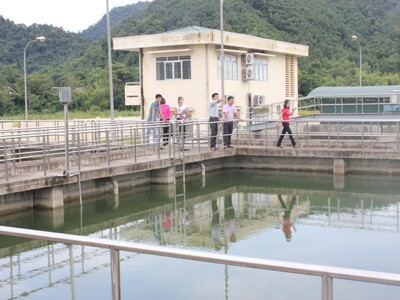 Over 10 years of development since its inception, Bac Kan Industrial Park Infrastructure Development Joint Stock Company has encountered numerous difficulties, mostly due to the inefficient operation of enterprises at Thanh Binh Industrial Park. Despite that, with the spirit of unity and continuous efforts, the company has always been ready to accomplish all tasks and meet the requirements of investors. However, there are also huge potential, advantages and a bright prospect for enterprises at Thanh Binh Industrial Park to develop. These are the opinions of Mr La Dinh Chinh, Director of Bac Kan Industrial Park Infrastructure Development Joint Stock Company. Duy Anh reports. Could you share your opinions on the operation of the company over the last time? Bac Kan IP Infrastructure Development Company (under the management of Bac Kan Industrial Parks Authority), established in 2006, has the function of constructing, managing and operating the infrastructure of Thanh Binh Industrial Park; collecting infrastructure use fees for the State budget, public service fees and waste water treatment fees for the management and maintenance of the infrastructure system of Thanh Binh Industrial Park. During the past 10 years, our company has completed phase 1 of the infrastructure of Thanh Binh Industrial Park, which has been put into operation since 2012 with the approved plan of 73.5 ha, constructing the floor area of 62.3 ha, of which the construction area of technical infrastructure is 19 ha; the area for investors to build factories is 43.3 ha and that for resettlement is 5.6 ha. The company, with competent staff, has ensured the effectiveness of Thanh Binh Industrial Park and completed the settlement of all of the 24 items of construction investment projects. However, due to the inefficient operation of enterprises in Thanh Binh Industrial Park and its delayed operation, its revenue was not as planned, reaching less than 20 per cent of the annual revenue plan. The infrastructure system construction investment at Thanh Binh Industrial park phase II project invested by your company will be implemented in the coming time. Could you say something about the project? Thanh Binh Industrial Park, Bac Kan province was approved in the Vietnam Industrial Parks Development Plan by 2015, towards 2020 under Decision 1107/2006/QD-TTg dated 21 August, 2006 by the Prime Minister. The investment project on building the technical infrastructure system phase I was completed in 2012 with the occupancy rate reaching over 90 per cent. Thus, there is no clean land for investors; on the other hand, the Thai Nguyen - Bac Kan Expressway, which was completed in 2016, is very convenient for trade and industrial production development, the demand for further investment in construction and expansion of Thanh Binh Industrial Park is very necessary for socio-economic development and the needs of investors throughout the province. The investment project on the construction of Thanh Binh Industrial Park technical infrastructure phase II of Group A was approved under Decision 1061/QD-TTg dated June 14, 2016 by the Prime Minister, with a total area of 80.3 ha and a total investment of VND390.174 billion. Its objective was establishing a new industrial park with the technical infrastructure system creating a land fund to build factories, attracting investment, creating jobs, contributing to the economic restructuring process of the province. The needed files of the project have been completed, submitted and appraised by Ministry of Construction, submitted to Bac Kan People’s Committee for approval. However, the project has used more than 60 per cent of the budget resources, and has not been distributed with capital to be carried out. Since 2014, many investors have been conducting surveys in Thanh Binh Industrial Park, some of whom have expressed interest in building factories for their projects. However, due to the lack of clean area, they have not been able to implement their projects. At the same time, the investment project on the construction of the new Thai Nguyen - Cho Moi National Highway 3 has been completed, connecting with the main road of Thanh Binh Industrial Park. This is a favourable condition for attracting investment as well as developing the park, contributing to socio-economic development, economic restructuring, job creation and increasing the budget. According to the survey of the industries proposed to invest in the park, most investors chose to invest in the industries which are the advantages of the province, high-tech and supporting industries. These projects, if implemented, will contribute considerably to our society, creating jobs, increasing personal income and improving the life quality of the people, in line with the guidance of the Government at Decree 210/2013/ND-CP dated 19 December, 2013 on the policy on encouraging investment in agricultural and rural area, policy on encouraging enterprises to invest in high-tech and supporting industries. Plus, there should be available clean land ready to be used for attracting investment. What message would you deliver to the authority as well as your partners? Bac Kan is a mountainous province with a large area of forest, which has many advantages for development of the forest economy; however, besides the investment in afforestation, it is necessary to pay attention to the processing of forest products. The investment in industrial park construction which creates clean land to attract investors to process forest products with large scale, high investment capital contributing to promoting socio-economic development, economic restructuring and creating jobs, is the most practical orientation of Bac Kan province.